A group of 11,000 nurses at the Veterans Affairs Department has reached an impasse with the agency over its collective bargaining agreement, as the Trump administration has declined to sign off on a contract proposal structured by a third-party arbitrator and the department’s own negotiators. VA Secretary Robert Wilkie disapproved of the agreement with the National Nurses Union. An arbitrator designated by the Federal Service Impasses Panel proposed the contract after VA and the union negotiated for more than two years. Most of the provisions of that proposal stemmed directly from those negotiations, while the arbitrator plugged in the gaps on the remaining areas of disagreements. 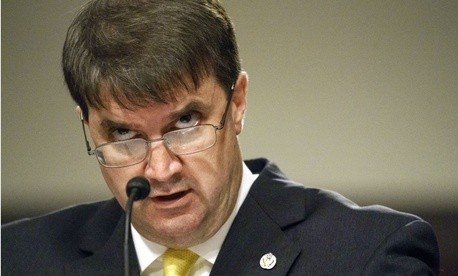 Wilkie took issue with more than 350 provisions of the proposed contract, citing sections of VA statute that prohibit the department from negotiating over clinical competence, compensation or direct patient care issues. The nurses union said his position did not pass muster, as 75 percent of the disputed provisions were accepted under the last bargaining agreement struck in 2012. Corey Lanham, the union’s VA division director, said Wilkie raised issues with clauses including scheduling practices, timelines for employees to transfer when they accept new jobs and the time VA has to correct errors in nurses’ paychecks. Issues such as those have no relation to direct patient care, Lanham said, and Wilkie had therefore “broadly overstepped his statutory authority.” Wilkie is only permitted by law to strike down an agreement between the union and the department if it contains illegal provisions. The nurses union will challenge the secretary’s actions in a forthcoming district court suit, while also seeking remediation on some provisions of the contract through the Federal Labor Relations Authority. Curt Cashour, a VA spokesman, said “multiple provisions” of the contract violated laws, rules and regulations, leading to Wilkie’s disapproval. By trying to place so much of the contract in a restricted category, Lanham said VA was essentially attempting to end collective bargaining for the nurses his union represents. Earlier this year, VA curbed the use of official time—the practice by which federal employees conduct representational activities while on the clock in their government offices—for its employees and unilaterally revoked provisions of its CBA with the American Federation of Government Employees, which represents 230,000 VA employees. The department was later forced to roll back those changes after a federal court struck down most of the provisions of the executive orders President Trump issued that led to their implementation. “This is a continuation of this administration’s anti-union animus,” Lanham said. The union’s challenges will likely take at least a year to wind through federal court and FLRA. In the meantime, the existing bargaining agreement will remain in effect. Lanham called the scope of Wilkie’s objections unprecedented, but said previous, smaller-scale efforts to move issues off the bargaining table have been rejected by FLRA and in court. The 11,000 nurses NNU represents work at 23 VA hospitals.